MONTREAL -- The Quebec government's bill to ban the wearing of religious symbols for some state employees is drawing wide-ranging opposition, from teachers donning symbolic hijabs in the street to an eminent philosopher who co-authored a report that inspired the legislation. But Premier Francois Legault stood firm Wednesday, saying people who would be excluded from public sector jobs because of the law can find other work. Earlier in the day, about 150 teachers, students and community members linked hands outside a Montreal-area high school, forming a human chain to protest Bill 21. 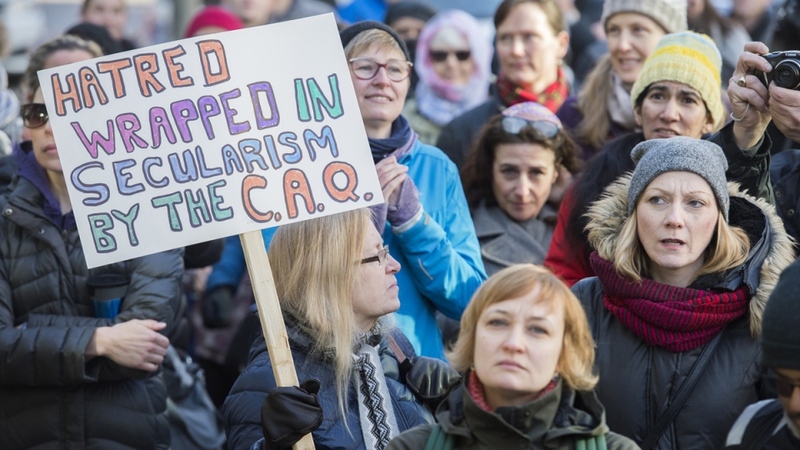 Many in the crowd wore kippas and hijabs in solidarity with those who could be locked out of the public service under the Coalition Avenir Quebec government's legislation to prohibit religious symbols for state employees in positions of authority. Teachers at the protest argued it's ridiculous to think that teachers who display their religion are less able to do their jobs or would try to convert their students to their beliefs. "Although we are authority figures, as they've labelled us, what we wear really doesn't influence our students in any negative way," said Westmount High School teacher Furheen Ahmed, who wears a hijab. "We're there like any of our other colleagues, teaching the curriculum, encouraging our students to be critical thinkers, to be good people, all those things." The legislation targets a number of positions, including teachers, Crown prosecutors, prison guards, judges and police officers. Those who are already serving in those jobs would be exempted. The Quebec government argues the bill is reasonable and in line with the values of Quebecers, but opponents have denounced it as discriminatory. They say it unfairly targets religious minorities and especially Muslim women, since teachers who wear the hijab are among those who stand to be affected. Among those denouncing the bill is Charles Taylor, a Montreal philosopher who co-chaired a government-mandated commission on religious accommodation that concluded in 2008. Taylor, 87, said the provisions of the bill are "clearly discriminatory." "If you practice certain kinds of religion, you don't get certain kinds of jobs, which other people who don't practice that kind of religion do get," he said. Not discriminating based on religion is an "absolutely elementary" principle of secularism that has been lost on the government, he added. In its final report, the commission chaired by Taylor and Gerard Bouchard did recommend restricting religious symbols for employees holding so-called "coercive authority," such as police officers and judges. Taylor has now fully rejected that "compromise" after realizing that the distinction between coercive and non-coercive authority was not a meaningful one to most people, and that the recommendation has been used as a premise to restrict freedoms to a much broader list of people. "This was meant to be a prudential move to stop something worse, but it wasn't doing that at all, so there's absolutely no more reason as far as I'm concerned to support that," he said, adding that Bill 21 could "give a certain colour of legitimacy" to those who hold Islamophobic beliefs. Taylor no longer supports any restrictions on religious symbols and says he'll be fighting the bill in any way he can. Questioned in Quebec City, Legault appeared undeterred by the fact that one of the fathers of the principle underpinning the bill vehemently opposes it. "It's of Mr. Taylor that you have to ask questions. He's the one who left the Bouchard-Taylor consensus," Legault said. "I continue to think that our position is reasonable." Legault appeared equally unmoved by the plight of aspiring teachers or police officers who wear religious symbols, noting that "there are other jobs available." At least two school boards and several Montreal-area mayors have promised not to enforce the bill, which has also been denounced by rights groups and Montreal's mayor. But opponents acknowledge it could be difficult to challenge due to the government's choice to use the Canadian constitution's notwithstanding clause as a way of shielding it from court battles. An association representing Jewish lawyers in the province says a legal challenge may still be possible. "We're looking into whether the notwithstanding clause usage covers everything they think they're covering," said Frank Schlesinger, chair of the human rights committee of the Lord Reading Law Society. Schlesinger said many lawyers, including Jewish men who wear kippas, could be impacted by the law, which would apply to anyone serving on a government committee as well as judges and prosecutors. Though he does not think Jews are the main targets of the bill, he says his group is also standing up to the government on principle. "If we don't stand up for everybody, what are we worth?" he asked.